For the last few weeks, I’ve been in Maluku, formerly known as the Moluccas, famous for spices and inter-religious carnage. The hideous religious riots of 1999-2002 have left a deep scar on this part of the country. Whole communities were uprooted and there was a shift between islands as people who formerly lived perfectly happily with neighbours of another faith consolidated into single-faith blocks. Needless to say, this makes me furious. I have never understood how people can grow to hate someone else because of who they choose to pray to, any more than I can understand hatred based on who people choose to sleep with. 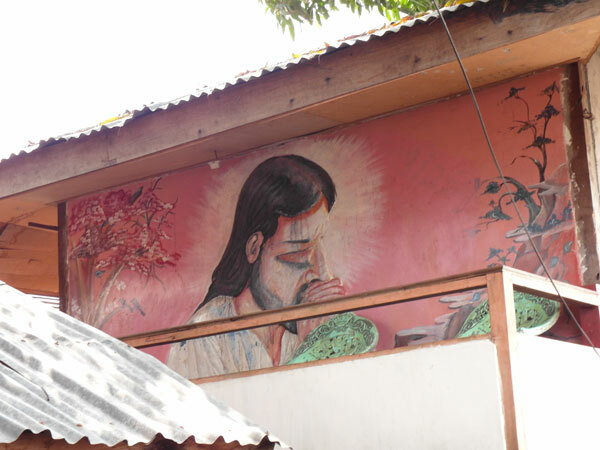 In the spirit of conciliation, therefore, I’m posting evidence that all religions in Maluku are equally adept at really kitsch religious art. 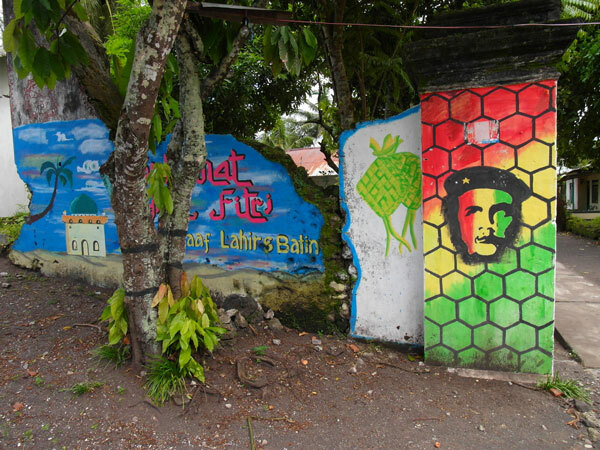 The Moslems in Banda Neira give us these Id-ul-Fitri wishes, complete with Arab style mosque and a Reggae Che Guevarra. 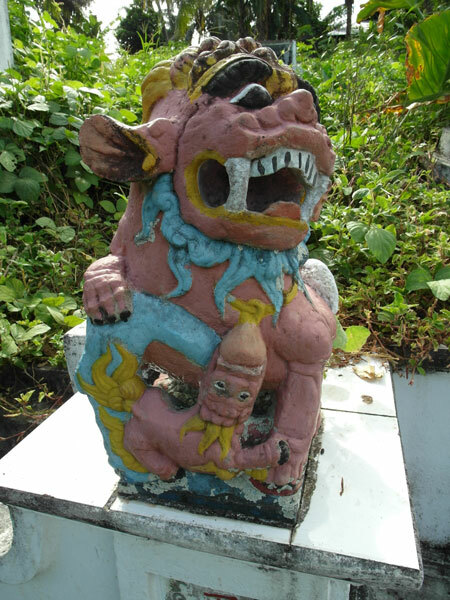 At the Chinese cemetery, also in Banda Neira, we have a breastfeeding lion standing guard over the graves. Further south in Saumlaki, in the Tanombar islands, virtually every house has some icon or other to offer to the competition. This Jesus Sneezed fresco caught my eye. I am sad to say that the Protestants have done less to defend their title to kitsch, and I have little to offer on that score. At the risk of being accused of bias, I do think Maluku’s Catholics have made a more than adequate contribution that perhaps makes up for the slackness of the other Christians. This larger-than-lifesized statue commemorating the first Catholic baptisms of head-hunting “savages” in Tanimbar takes some beating. Be the first to comment on "Equal Opportunity Kitsch"